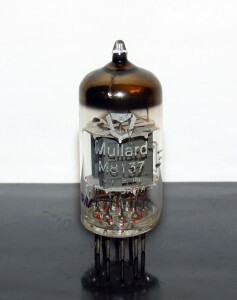 This entry was posted in Vacuum Tubes and tagged 12ax7/ECC83, Mullard by tubemaze. Bookmark the permalink. These tubes are getting harder and harder to find since they were not produced in huge quantities as so many other tubes. This is military 12ax7 with great looking toast plates which are quite unique to Mullard and only now are being replicated by Full Music. Sound of this tubes is not what you topically expect from Mullard, it’s not warm, but more like the later production 10M tubes with very dynamic sound, fantastic details and great bass. Not a tube for everybody – if you like rock or any music with a lot of punch, the tubes is one of the best available, but if you are looking for warmth and relaxed sound, this is not the first choice in the 12ax7 family. Because of the structure of the tubes, it’s has ultra low microphonics and very low noise floor – I measured it at -88dB!!! This is unheard of in 12ax7 family.